Powers/Abilities: Skilled in stage magic. History: When Jeff Grant was a young boy his ranch was raided by hostile Native Americans. The only survivor, Jeff could hear their guns still firing for ages after the raiders left, a scarring memory that left him with a lifelong hatred of firearms. For three years he lived alone in the wilderness, untrusting of any other human, becoming skilled in the use of bows, spears, lassoes, and wilderness survival. Eventually though he was spotted by a travelling magician and "medicine" salesman, Dr. Crowell; scared, Jeff fled but failed to look where he was going, and ran into a tree, knocking himself out. Crowell treated his injuries, winning over the frightened child, convincing him to travel with Crowell, keeping him company and learning stage magic tricks from him in return. However, after six months travelling together, the pair were confronted out on the trail by a masked gunman with a distinctive scar on his wrist, seeking revenge for Crowell having reported him to the law in the past. Jeff tried to save his friend but was knocked out, and when he came round the gunman was gone and Crowell was dying from a gunshot. Before he passed away, Crowell informed Jeff that the killer hung out near the town of Red Gulch, so Jeff travelled there and set himself up as the town blacksmith, spending years hoping to find his friend's murderer. Eventually the gunman showed up; knowing it would be difficult to capture the outlaw without using a gun, Jeff decided to disguise himself so that if the villain eluded him that night Jeff could stay on as Red Gulch's blacksmith and try again later. Donning a costume made out of Crowell's old stage suit, which contained a multitude of hidden pockets to store magic tricks, Jeff successfully apprehended Crowell's killer and handed him over to the local sheriff. 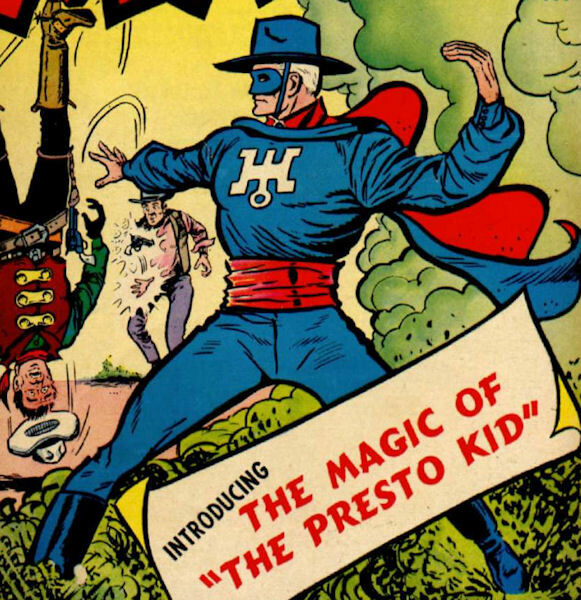 When the sheriff asked the masked man who he was, Jeff decided on the spur of the moment to keep his real name a secret, feeling that this would give Red Gulch two men fighting for law and order instead of one, and he proclaimed himself to be the Presto Kid.